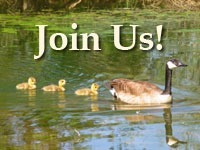 The Goose Creek Association has published a Report Card grading the water quality of Goose Creek and its tributaries. We are happy to announce that our water is pretty good! We invite you to review the analysis of the Piedmonts’ most pristine creek and its surrounds. Goose Creek’s overall score of “pretty good” can be attributed to greater area with less development and more forest and farmland, than with higher development and increased land use. However, some negative scores indicate the impact of farm run-off, and increased development on the watershed. 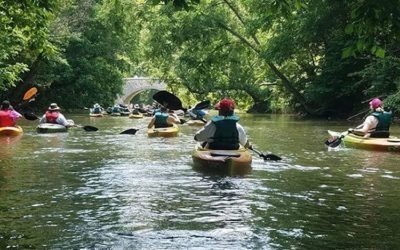 Our watershed is a “treasured” part of the Potomac and Chesapeake watersheds, and we want to keep it that way. Goose Creek Association’s tree planting program, the Goose Creek Challenge, is working to increase our riparian buffers that will help keep our water clean. 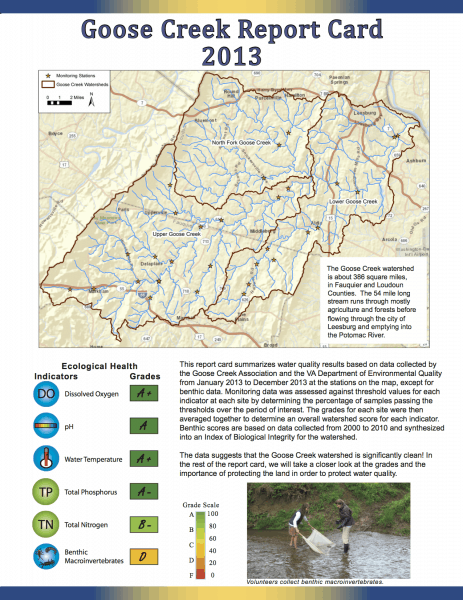 Aquatic life thrives and the water is healthier by planting trees and shrubs to filter the rain and run-off while reducing erosion.Get the scoop about Goose Creek’s water quality by reading our attached Report Card.